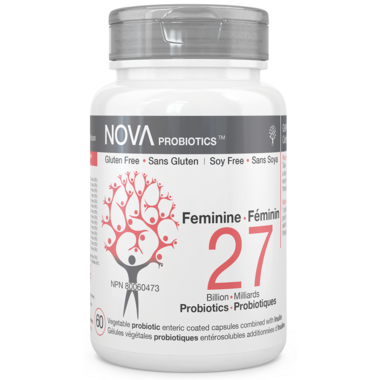 NOVA Probiotics Feminine was formulated for women and their specific needs regardless of age. With 27 billion live microorganisms per capsule, it helps restore and maintain a healthy balance of beneficial bacteria to support digestive and vaginal health. Its unique combination of 14 probiotic strains has many benefits for women. Directions: Take 1 capsule, 2-3 times a day with meals or as recommended by a therapist. 14 Medicinal Strains: Lactobacillus rhamnosus NVA191, Lactobacillus plantarum NVA139, Lactobacillus rhamnosus NVA119, Bifidobacterium breve NVA053, Lactobacillus paracasei NVA234, Lactobacillus casei NVA180, Lactobacillus acidophilus NVA116, Bifidobacterium animalis subsp. lactis NVA051, Propionibacterium freudenreichii NVA420, Lactobacillus reuteri NVA235, Bifidobacterium longum subsp. longum NVA027, Bifidobacterium bifidum NVA020, Bifidobacterium longum subsp. infantis NVA041, Lactobacillus delbrueckii subsp. bulgaricus NVA160. Great product. Seems to work better than the other brand I was using. I will buy this again. I will definitely buy this product again! Has helped ease my stomach problems and I love that these don't have to be refrigerated! This brand was recommended by my naturopath years ago and I still use it to keep my candida under control. I feel better when I take it, even just one a day. this product is amazing....eases my cramps and bloating, and is in my purse wherever I go! would definitely recommend.